My Year As Mayor: What's in a name? It's election season, and that means many requests to those of us who are electeds to endorse candidates. Because I do a lot of work with cities in my PR business, I am not endorsing anyone in city council or mayor races, but I am happy to lend my name to quality candidates for regional, statewide and national offices. 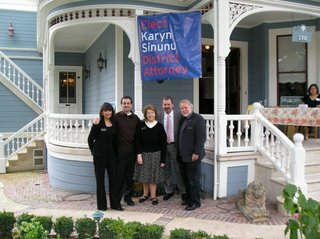 One of these is Karyn Sinunu who is running for District Attorney. A campaign event for her this afternoon in the Los Gatos home of Rick and Julie DiNapoli brought out a couple hundred supporters including my fellow Los Gatos Town Council Members Joe Pirzynski, Barbara Spector and Mike Wasserman and Saratoga Mayor Norman Kline. You'll also see my name on the endorsement lists of County Assessor candidate Larry Stone, County Supervisor Don Gage, Assembly candidate Jim Beall, Santa Clara Valley Water District Director Rosemary Kamei, and our Congressional Representative Mike Honda.